One of the students in an Amazon training session she talked to said “I don’t understand what Americans want,” as he was trying figure out what products to sell. It is hard to appreciate the scale of interest in Amazon without having been to one of the export and manufacturing hubs in China. Thousands of entrepreneurs are starting on Amazon every month. The hardest position to be in is the US based private label sellers. The Chinese sellers are doing virtually the same, but with one less middleman. They are not as successful yet, as experience and knowledge in Amazon-specific skills is not common in China, but this is the problem all those training sessions are trying to fix. Physical goods are rarely made in the US. Often the country of origin is China. China has been exporting goods to the US for decades, but now Chinese manufacturers want to sell direct-to-consumer. Marketplaces like Amazon are a perfect avenue. Although this goes beyond Amazon, as eBay and other marketplaces are used too. 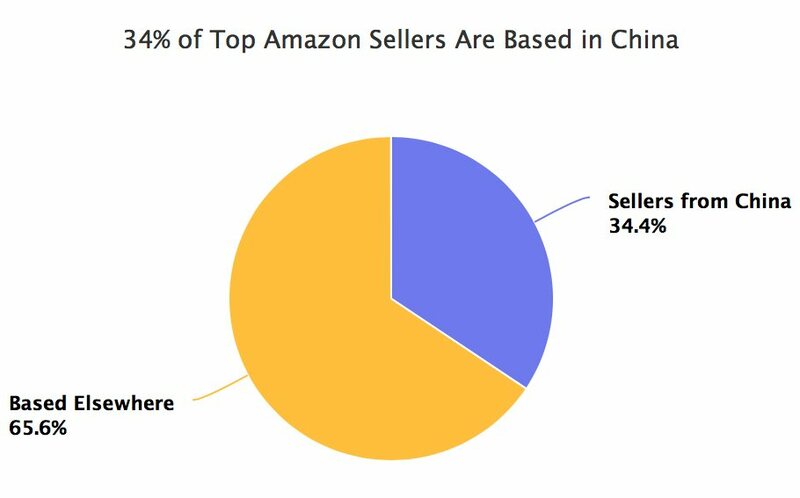 This increasing interest has meant that today 34% of top Amazon sellers are based in China. Based on a combined average of Amazon’s 5 European marketplaces (UK, Germany, France, Italy, Spain). All online retailers in Europe are required to disclose their business location by European Union law, and this also applies to sellers on marketplaces. The business information was analyzed to determine sellers’ locations. Unfortunately this is only possible for the European marketplaces, and the same analysis is not possible for Amazon.com. Nonetheless China sellers share in the US is even higher. Data to validate this is unavailable, but given that Amazon.com is the largest marketplace in terms of GMV it also has the highest appeal. FBA is the key feature allowing international sellers to compete with domestic sellers - 71% of Chinese sellers are using Fulfillment by Amazon (FBA). Compared to 47% average for all sellers in Europe. Unfortunately for US retailers competition is only going to get harder. When it comes to selling goods made in China the value of a US retailer sourcing them as opposed to a manufacturer selling directly is small. A customer doesn’t notice this, all they want is low price. This is globalization in effect. An essential feature of a marketplace like Amazon is removing friction from retail. “With the loss of friction, there is necessarily the loss of everything built on friction, including value, and livelihoods.” Sourcing of goods constrained by geography, what retail used to be, is friction. Amazon marketplace is showing what happens when that friction is removed. 30 years ago Walmart launched “Buy America” program and started hanging “Made in America” signs in its stores. But there is no “Buy America” on their website, and the Walmart marketplace is allowing international sellers too, many of which are from China. Maybe this is the opportunity for Walmart to differentiate from Amazon. Out of the one million new sellers on Amazon so far this year, 80,000 sellers joined Amazon in the UK. 26% of those are based in China. In Germany the percent is close to 27%, as it is in Italy, and France, but almost 30% in Spain. European marketplaces combined attracted as many new sellers as Amazon in the US. Thus more than 250,000 sellers from China joined Amazon in 2017 alone. The winners and losers of this will take years to show.